Alexandra Momyer is a certified personal fitness trainer who began writing professionally in 2010 for various websites. Momyer specializes in youth fitness and is pursuing certification in complete nutrition through International Sports of Sciences Association. At the beginning of a normal menstrual cycle, your estrogen level increases, making the lining of your uterus grow and thicken. One of your eggs then starts to mature in one of the ovaries. At the midpoint of your cycle, the egg leaves the ovary, which is known as ovulation. Your egg then proceeds to travel through the fallopian tubes and into your uterus. But when the uterus has no use for the extra thick lining, it starts to shed, starting the most visible part of menstruation. Exercise is beneficial to your body and menstrual cycle, but when you take exercise to the extreme you negatively affect your body and menstrual cycle. Amenorrhea means the absence of menstruation. If you miss one or more menstrual cycles, then there is likely a reason for why your body has developed this condition. Primary amenorrhea is when a woman has reached the age of 16 and still lacks menstruation. This condition is common in very thin or athletic girls and requires a visit to your doctor. For other girls, the delay could be due to a condition known as Turner’s syndrome, which is a genetic disorder where a girl’s female reproductive organs function abnormally. Secondary amenorrhea is when a woman has had normal menstrual cycles in the past, but has stopped menstruating for more than three months. Women develop this condition due to several factors, including birth control pills, emotional or physical stress, rapid weight loss, obesity, frequent strenuous exercise and cysts or tumors in the ovaries. Women who engage in extreme, high-intensity exercise or focus on low bodyweight are more likely to develop amenorrhea. Engaging in a healthy amount of regular exercise offers you many benefits when it comes to your menstrual cycle. 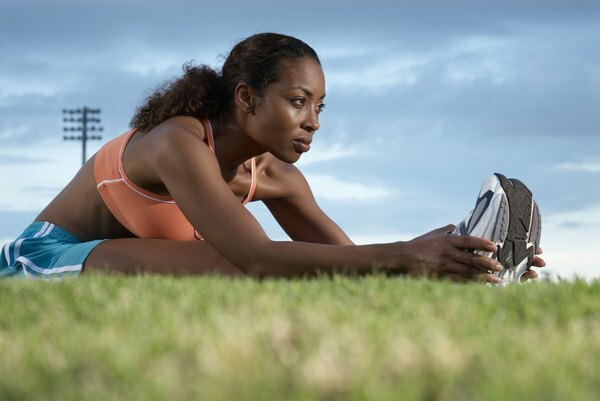 Regular exercise helps relieve cramping, pain and bloating caused by menstruation. As you exercise, your blood circulates through your body and creates relief from headaches. Exercise also helps your body release endorphins, which reduce cranky and depressed feelings. You may also notice that you sleep better at night. Exercise may help control your cravings for sweets and junk food during your period as well. If you are obsessed with exercising excessively and engage in three to five hours of daily physical activity, you're putting your body at risk of developing serious problems. Working out requires a enormous energy, and without proper fueling for your body, it can’t keep up. Instead, your body starts to shut down unnecessary functions so that it can use the little energy it has to keep your basic life functions working. Because the object of your menstrual cycle is to reproduce, it’s not critical to your life; so your body will shut down the function to save energy. Lack of menstrual cycles can cause osteoporosis due to loss of bone density, so your body needs normal menstruation to return as soon as possible. Reducing your amount of daily exercise enables your body to receive the nutrients and calories necessary for normal function. It may take some time for your body to adjust back to normal again but you should begin to have menstrual cycles before you know it. If you suspect that exercise is not the source of your absent menstrual cycle, contact your doctor. FitSugar: Can Exercise Affect Your Menstrual Cycle?